According to the ManpowerGroup's Annual Talent Shortage Survey, the hardest skilled positions for employers to fill have not been engineers, nurses, or sales representatives. The number one most difficult people to find are skilled trades workers such as electricians and welders. The need for skilled tradespeople is expected to become even more acute as more baby boomers hit retirement age and exit the labor force. Trades are disproportionately affected by this phenomena because trades people are on average older than many other segments of the workforce. Enrollment in trades has declined over the past several decades as many young people incorrectly perceive the trades to be poorly paid. They see them as not intellectually stimulating and "beneath them." More than 60 percent of skilled trades workers are 45 or older in some North American locations. High demand is one reason the skilled trades are ideally suited for those wishing to become self-employed and start their own businesses. Another is that most trades can be operated as home-based businesses because the work is typically performed at the customer job site. A third reason is that startup capital costs for things like vehicles and tools are relatively low for most trades, at least compared to many other types of businesses. Skilled trades cannot be automated to any degree, ensuring future job security. Even in the welding trade, which is automated to a certain extent in manufacturing, there are many types of jobs that cannot be feasibly automated. Here are some of the best business opportunities in the skilled trades. Electricians design, install, maintain, and repair electrical wiring and electrical/electronic control systems in homes, commercial buildings and industrial installations. Although electricians are employed in a wide variety of industries, most electricians work in construction. 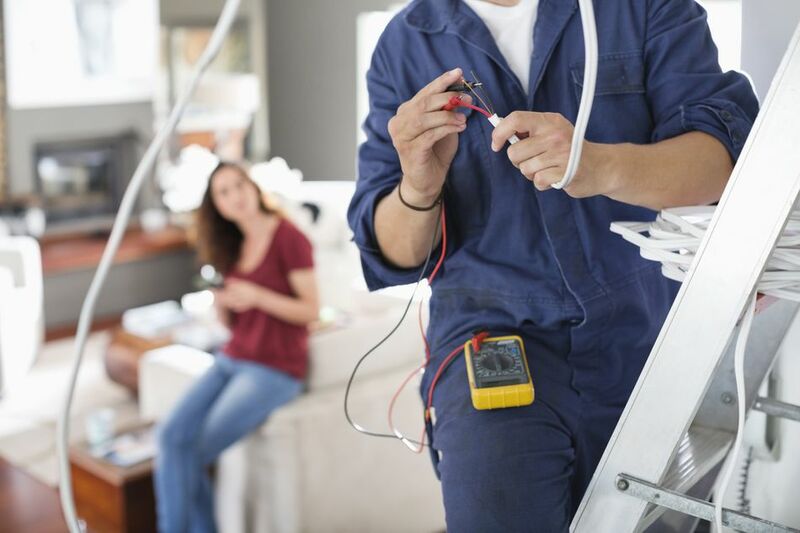 The U.S. Bureau of Labor Statistics projects a growth rate of 14 percent through 2024 in the demand for electricians. This is much higher than the average for other occupations, making it an excellent career choice and an ideal business opportunity. Becoming an electrician normally requires four to five years of apprenticeship and in-school training leading to certification. HVAC technicians install, maintain and repair residential and commercial heating, air conditioning, ventilation and refrigeration systems. Some HVAC professionals specialize in related areas such as fire protection and sprinkling systems, oil and gas burners, and building and facilities maintenance. As with electricians, HVAC specialists are expected to experience a high growth in demand for the next decade. The HVAC industry is also well suited to those wishing to become self-employed. Unlike with some other skilled trades, HVAC systems require regular maintenance after installation. Selling service contracts can provide steady cash flow. Starting a career in HVAC usually involves one to several years of post-secondary education and on-the-job apprenticeship training. Due to the increasingly technical nature of the industry, certification is mandatory in most states and provinces. Masonry is another profession that is projected to have a much higher growth in demand than average. Masons use a variety of mortared bricks, stone and concrete to construct walls, patios and walkways. Highly-skilled masons who can create artistically designed masonry structures will never lack for employment. Becoming a mason normally requires three to four years of apprenticeship training along with classroom instruction. The job requires lifting heavy materials, so a mason must be strong and physically fit. Given the high demand for skilled masons, masonry can be an ideal business opportunity for those wishing to become self-employed. Starting a business as a self-employed mason may require licensing in some locales. Plumbers design, install and repair piping, waste disposal systems, and related appliances and fixtures in homes, businesses and industrial plants. Pipefitters and steamfitters install and repair piping systems that carry pressurized liquids or gases used for heating and cooling, energy production and manufacturing. The demand for plumbers and pipefitters or steamfitters is expected to be very strong through 2026, making either profession an excellent business opportunity. Training normally requires several years of apprenticeship in combination with technical school instruction. Most locales require plumbers to be licensed or certified. Welders use a variety of different types of equipment to cut or join metal parts. Welding is used in many different industries, including construction, auto body repair, forestry, oil and gas, metal fabrication and shipbuilding. Welding can be manual or semi-automated. Welding is expected to experience average job growth, but skilled welders are always in demand. A willingness to travel and the ability to work in remote locations and/or under difficult conditions can enable a skilled welder to earn a substantial income. Becoming a welder normally requires technical training along with an apprenticeship, eventually leading to certification. Different industries tend to use specific types of welding so mastering the correct type is essential for working in a particular industry. The nature of the welding business makes it a good candidate for self-employment. A typical welding contractor starts with mobile welding equipment and may eventually require shop space if business expands.